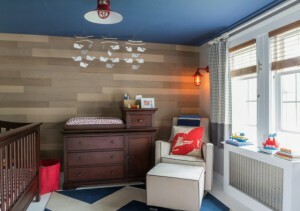 Project Nursery named our latest baby boy nursery as the winner in their July Project Gallery. We couldn’t have done it without your vote! See the full write-up from ProjectNusery.com. This adorable family in Hingham wanted their baby boy’s room to pay homage to their time on Cape Cod. The result? A modern take on a classic nautical theme (complete with a weathered panel wall!) Best part of this nursery? (Besides the beyond-cute whale mobile?!) It’s totally tot-safe thanks to our friends at Your Family, LLC.